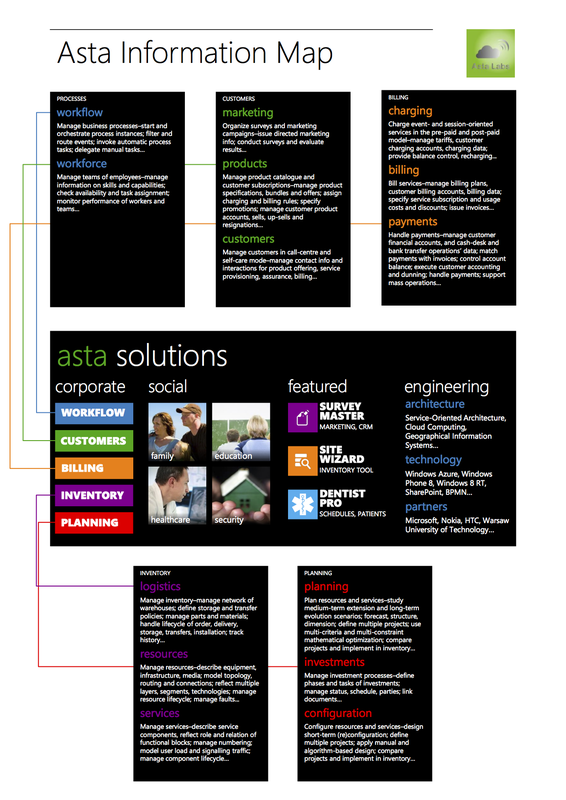 Compliant with SOA-based Asta Architecture, every solution is composed of a collection of loosely-coupled subsystems. Each specific domain of the solution is covered by a separate subsystem, which can be potentially replaced with a third-party module. Implemented on the Asta Platform, all solutions are mobile cloud-computing systems available in the SaaS model. The system services are deployed in the public or in the private cloud, and are accessed from client applications that are available for smarthpones, tablets and also desktops. That guarantees high availability, scalability and mobility as well as fast and inexpensive deployment and low costs of ownership. The deployment of the solutions is straightforward – to acquire the system a company should complete the electronic registration process which automatically sets the company’s private instance of the system (data repositories and business logic) in the cloud and allows the company’s administrators, managers, ordinary workers and also customers to download their role-specific applications from the app stores, register in the system and start using its services.